L'Eurocamping Vessem est un camping adapté aux enfants. Il se situe dans un environnement boisé au milieu de charmants villages du Brabant. Le camping dispose d'une partie touristique bien entretenue avec de grands emplacements et beaucoup d'espace de jeux. Il y a suffisamment à faire pour tout le monde : de la natation aux parties de foot, de la pêche aux sauts sur le château gonflable. Eurocamping Vessem bénéficie de l'environnement boisé de la campagne du Brabant. Autour du camping, vous trouverez de nombreux villages typiques et des domaines naturels où il fait bon se promener et faire du vélo. Que vous soyez installé sur votre emplacement de confort ou assis devant votre tente Lodge, il est fort probable qu'une jeune famille séjourne sur la parcelle voisine. Le camping est en effet extrêmement adapté aux familles accompagnées de jeunes enfants, mais aussi d'adolescents. Cependant, l'endroit attire des campeurs de tout type. En haute saison, des vacanciers de toute l'Europe - notamment de l'Allemagne, de la France et des Pays-Bas - viennent au camping. En basse saison, vous rencontrerez principalement des campeurs français « d'un âge avancé ». La piscine en plein air avec pataugeoire se trouve au milieu de grandes pelouses. Depuis la piscine, vous pouvez rejoindre directement le parcours de minigolf, grimper dans l'aire de jeux ou monter sur le château gonflable. Vous pouvez aussi vous rendre sur l'un des terrains de sport si vous désirez frapper une balle. Le camping possède en outre un bel étang de pêche pour des heures de détente nécessaires. Jeter un hameçon dans l'eau et s'adosser, il n'en faut pas plus pour se relaxer. L'inspecteur effectue une visite annuelle au Eurocamping Vessem et inspecte le camping sur base d'environ 200 équipements et autres points d'intérêts. L'inspecteur est un collaborateur d'ACSI et ne travaille pas pour le compte du camping. We arrived as convoy of four campers. We planned on staying 4 days but only stayed 2 would of been less but we gave it the Benefit of the doubt on second day...on arrival The father said “No space immediately” then the son jumped in and said yes there is and it was as if we were just not wanted there. Seems to be a lot of owners there or locals who get served first whether your at the front of the que or not. Friend got spat on by local child/owner. Not enough food options for such a big park. Toilet/showers look like something out of a horror movie. I would not stay here again if you payed me to. Eurocamping Vessem is THE place to go. The staff were incredibly inviting and spoke perfect English. They had also helped me prior to my visit in terms of questions regarding the site i.e electricity. We were welcomed by Corrie and her sister with lots of wonderful information about the surrounding lands of Vessem and a fantastic tote bag which we will treasure. The Site - Perfectly maintained and very clean. Other campers were a perfect distance from each other. Each site had a point to have electricity and again was incredibly spacious (we had a 6 man tent with parking for the car included). There is a pond for fishing, a cafe, a bar, lots of sports facilities and a swimming pool with lots of entertainment on. Toilet and Shower facilities - beautifully kept and cleaned EVERY DAY, shower facilities again were very spacious and there was always one or two spare. an extra for shower but I think this is incredibly reasonable for the hygiene and cleanliness of the place. Curfew - There is a curfew of 11:20pm and we must have missed this in our information pack that was provided. This meant that the car could not be parked next to the tent for that night. This was not an issue as there were plenty of parking spaces outside the campsite and was an easy walk. How could you improve? - My husband and I agree that we would not change a thing in terms of the site. It really was incredibly well thought out. The only thing we could ask too see in the future would be souvenirs. We are avid collectors of fridge magnets and was disappointed that there wasn\'t any to purchase. We would\'ve loved a little Epce toy too!!!! Thanks for going above and beyond for us ladies. Rest assured we will be back!! N'a pas aimé - As adults, we liked to be at the end of the camping place, far from the kids activities. A aimé - We had a brilliant stay on this site. The owners we found very helpful and Ralf particularly went out of his way to help us with an off road cycling route which was fantastic. There are three very new looking swimming pools, large trampolines, playgrounds, football goals, tennis, beach volleyball, table tennis tables and even an 18 hole crazy golf course, all of which are included in the price. The site is very clean, with great showers (one 50c piece for the hot water) and there are more toilets than I have seen on any other site. We will definitely be coming back. N'a pas aimé - On the multitude of smaller 2 toilet blocks, I would have liked sinks next to the toilets for washing our hands, rather than having to go to another block where there are sinks. This has to be one of the best campsites we've ever had the pleasure of staying at. Stunning scenery with large pitches and we loved being able to park our motor home sideways on so we faced the middle of the area we were set, which always makes it feel more open. The owners we found very helpful and Ralf particularly went out of his way to help us with an off road cycling route which was fantastic. There are three very new looking swimming pools. A toddler splash pool, A 60cm to 120cm depth pool and a 120cm to 140cm depth pool. There are large trampolines, playgrounds, football goals, tennis tables and crazy golf, all of which are free like the pool. It's fair to say the crazy golf course is well past it's best, but it doesn't affect the playability. More importantly it is a great way to have some family fun and doesn't cost a penny to do. We have found all the toilets and showers very clean. The showers are good size cubicles and hot water is a 50cent coin. There are multitudes of little two toilet blocks all over the site. You are probably never more than 100 metres from one, which is great, but I do wish they had sinks with them like the larger blocks. There are always separate washing up sinks in other small blocks nearby though. We have loved our 5 days here and will definitely look to come back as soon as we can. Just one last thing on motorhomes. The photo on this site which shows a load next to the playground is the no reservation pitches. If you book, you drive on to the site and have a much more beautiful pitch. Est-ce que vous souhaitez réserver le camping Eurocamping Vessem ou obtenir plus d'informations? Dans ce dernier cas, consultez les explications ci-dessous ou visitez le site Web du camping. A58, sortie 8 Oirschot direction Middelbeers, puis Vessem. Camping indiqué sur la route Vessem-Hoogeloon. 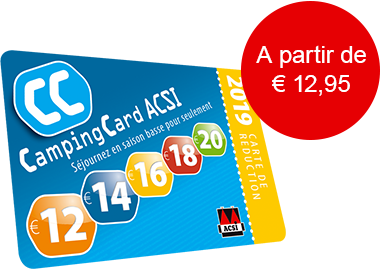 ACSI Eurocampings transmet votre demande d'informations au "Eurocamping Vessem".